Blindsgalore, online at Blindsgalore.com, offers the best options for blinds and more. Choose from their selection of blinds, shades, curtains, drapery, shutters plus a variety of window coverings and window treatments. Make sure your window coverings fit your needs and check out Blindsgalore selection of featured window coverings like black out shades, child safety shades, cordless shades and blinds, eco friendly shades and blinds, energy efficient shades and blinds and remote controlled shades. Shop with top brands like Bali, Blindsgalore, Levolor, Graber, Kirsch and Comfortex. Before you shop remember that RetailSteal.com has the best Blindsgalore coupon codes, Blindsgalore promotions and Blinds Galore discounts. Shipping is free on all orders up to 100" in width. Contact customer service within 7 days of delivery if you have a problem with your order. Check website for full details, exclusions may apply. 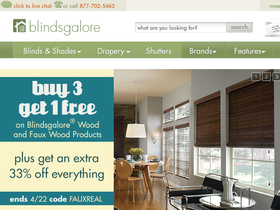 Use this coupon code at Blinds Galore to save an extra 10% off everything sitewide. Act now and enjoy an extra 20% off Levolor products with this coupon code from BlindsGalore.com. Shop at Blindsgalore and find savings of up to 40% on retail prices. BlindsGalore offers free shipping on orders up to 100" in width. Click link to shop now. Shop online at BlindsGalore.com and you won't have to pay sales tax. Residents of select states are excluded. Shop Blindsgalore Bargains to find blinds for as low as $18. Click link to shop. Take 15% off XL Pleated Shades at The Shade Store. Click link to buy. Take 15% off your purchase using the coupon code and get free shipping when ordering online at The Shade Store. Click link to save. Enjoy a $150 discount on your order of $1000 or more with this coupon code from TheShadeStore.com. Spend $500 or more at The Shade Store and they'll reimburse you up to $75 for your professional measurement. Hurry over to The Shade Store today and save $50 on your order of $500 or more. Simply enter this coupon code at checkout to enjoy these savings.